The Arizona species that most resembles the Lavender Dancer is the Variable Dancer. Both species can occur at a same location. The best way to differentiate males of these species in the field is by examination of the abdomen tip. Additional differences are noted by examining the eyes and thorax. 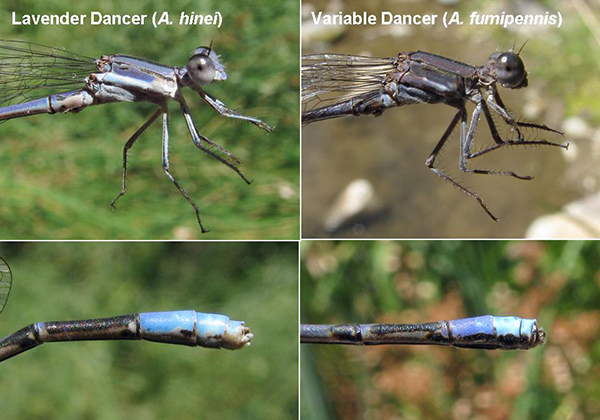 Variable Dancer: abdominal segment 8 is violet, thus contrasting in color with blue segment 9. Segments 8 and 9 have thick lateral black stripes. Variable Dancer: lower half of eyes is dull violet. Both species have forked humeral stripe. The side of the thorax in the Variable Dancer often has a white dot that is absent in the Lavender Dancer. Lateral views of the head/thorax and of the appendages of the Lavender and Variable Dancers, AZ.